Strengths: Hisako's best strength is her ability to make people scared to act. She has the fastest and longest-range forward dash in the game, which can low-profile certain attacks, a command grab faster than any normal that can lead to a combo, and the ability to counter attacks on reaction and convert into big damage from anywhere, including things like shadow counters and some punish attempts. Her normals control massive sections of the screen, making head-on approaches difficult from the ground or the air. There will be times when Hisako makes you feel like no action you can take is the right action. Weaknesses: When she is not dashing, Hisako has, by far and away, the worst walk speed in the game, which means she needs to commit to movement in large chunks and it can be difficult for her to hold an area of the screen. All of her grounded special moves are unsafe if blocked or avoided, so they must be used with care and deliberation; Hisako can situationally make some of these approaches risky to punish if she has Wrath Meter, which requires patience and good meter management. Without full Wrath, opponents can take more chances against Hisako and not fear as much retaliation. Hisako can also not combo off her light attacks without spending shadow meter. Notes: Hisako only has one shadow linker that is useful during the proper combo sequence, which is shadow On Ryo Zan. Since it is extremely slow, it makes sense to spend her meter on the shadow Possession damage ender first, and as a result, the 2-meter punish isn't substantially larger than the 1-meter punish. On Ryo Zan linkers are a little faster than Influence linkers and do slightly more damage. In instinct, Hisako can freestyle manual combos in cool ways, but they are not ideal for maximizing damage during a lockout. Above Hisako's shadow gauge is a green Wrath meter, which starts the game full and drains whenever Hisako performs certain actions. Pressing any medium or heavy normal or performing any special move drains the Wrath gauge by a set amountA heavy normal drains your Wrath by 25% and a medium normal drains Wrath by 20%. Aerial On Ryo Zan, Possession, and Influence special moves drain Wrath by 20%, and the first hit of a grounded On Ryo Zan drains Wrath by 10% (you can continue to the second and third hit of On Ryo Zan at no extra cost). Vengeance does not cost Wrath to perform in neutral.. Wrath will start to refill as long as Hisako is standing still or walking; it will not refill if Hisako is attacking, dashing, jumping, in block stun, being hit, or knocked down. If your Wrath is empty due to continued attacks, Hisako will need to find an opportunity to sit still and not press buttons to gain it back. Wrath will refill from empty to full in about 1 second, which isn't very long, but the fast-paced nature of KI makes it difficult to find the reprieve you need to keep Wrath full. It's important to note that even if your Wrath is empty, Hisako can still use normals and specials that would otherwise drain the Wrath. If Wrath does not prevent you from using these moves, what's the benefit to keeping Wrath full? There are three main benefits to having Wrath. Firstly, if your Wrath is 100% full, every medium normal, heavy normal, or On Ryo Zan (both ground and air) is a counter-hit. Counter-hits in KI normally add a small amount of hitstun and increase the damage slightly, but Hisako's counter-hits are special; they do massive amounts of hitstun. In particular, close HK, far HK, and close HP will all cause stagger on counter-hit, which lets Hisako dash in and continue the combo with another attack. This means Hisako is scary from range and in close when she has full Wrath, but if she performs a normal or special and you don't get hit, the counter-hit threat is gone for a short amount of time, until her Wrath is full again. Secondly, if Wrath is 100% full, her close-range Influence command grab and aerial On Ryo Zan, normally hard knockdowns, will instead act as openers (aerial On Ryo Zan will recapture opponents if they are airborne to start a grounded combo). This allows Hisako to get combos in situations she otherwise wouldn't, but the threat is again front-loaded to just one attack; if you are able to convince her to spend wrath on a normal attack or avoid a special move, you are free from this threat until Hisako finds space to allow her Wrath to refill. However, a Hisako with full Wrath in your face is quite terrifying, since you must respect a counter-hit normal, the threat of a command grab, and the possibility of a cross-up air On Ryo Zan, all of which will lead to full combos. Lastly, if Hisako has more than 50% wrath remaining (as indicated by the icon in the center of her Wrath gauge), she can cancel moves into a Vengeance counter or Descent teleport for 50% of her Wrath. She can cancel any grounded normal or special (except shadow moves, Influence, or another Vengeance counter) at any point, including during its startup, active frames, or recovery. This has numerous important applications. If someone jumps over a laggy normal, Hisako can Vengeance cancel to punish any jump-in attack. If someone tries to punish the otherwise unsafe grounded On Ryo Zan strings, Hisako can make them pay with a correct read, or teleport to keep them on their toes. If someone tries to reversal through pressure with a screen-freezing move, or any shadow counter, Hisako can react to the freezeHisako cannot apply this technique to moves that have 0 frames of startup after the freeze, such as Jago's shadow Tiger Fury or Thunder's shadow Sammamish. with a Vengeance cancel, even if she has committed to another move. The end result is that if Hisako has played intelligently and kept her Wrath over 50%, many of her opponent's stalwart defensive options become limited and risky to perform. Hisako can force you to question what actions you're able to take, and this hesitation can lead to command grabs or other tricks. Interestingly, Hisako really only has one primary special move opener that is reliable to use as a footsies tool, which is grounded On Ryo Zan. This three-stage rekka move will trigger the opener on the third hit only, and the second and third hits can either be slow low attacks (LP), slow overhead attacks (MP), or fast mid-hitting attacks (HP), and these hits can be mixed and matched to test an opponent's blocking mettle. All hits of all versions of rekka are quite unsafe on block (-10 or worse), but at maximum range it can be difficult to punish the earlier hits. Not only are the rekkas unsafe, but there are gaps between the low and overhead swings which can be interrupted by an opponent's normals. To stop people mashing buttons after blocking the first hit of On Ryo Zan, you have two options besides trying to pick a better range; either use 50% of your Wrath to cancel into a Vengeance counter, or use the HP rekka which has a much smaller gap designed to counter-hit buttons or attempts to jump away. If they patiently block, however, this is a risk that puts Hisako at continually worse disadvantage. Shadow On Ryo Zan has outstanding range and is fully projectile invincible, and can be used to beat all projectiles from well over half screen away on reaction easily. Unfortunately, there is not enough frame advantage after On Ryo Zan or shadow On Ryo Zan to perform a manual; if you use this as your opener, you must follow up with an auto-double or a linker. The same is true for a full Wrath Influence. Vengeance is a very unique move in Killer Instinct. It has two versions, a high version (PPP) that counters all overhead and mid attacks, and a low version (KKK) that counters all low attacks. It is active on the very first frame and if an appropriate strike hits the counter, it will always begin a combo, no matter where Hisako or her opponent are on the screen. However, Vengeance will never counter throws, projectiles, or unblockable attacks (like Glacius's Shatter or Sabrewulf's charged Overpower). Although you can cancel into Vengeance from certain moves with 50% Wrath, Vengeance itself is not tied to Wrath in any way; it always acts the same way no matter the state of your Wrath meter. Because Vengeance is an opener, it is always cancelable into auto-doubles or linkers, but which manuals are possible depends on what animation plays when Vengeance connects. If Hisako is close to her opponent and both characters are grounded, she will play a close range counter strike that allows only light and medium manuals. But if Hisako catches an aerial or long-range attack, Hisako will leap into the air and slam her opponent to the ground. This version leaves you at huge frame advantage and even the slowest heavy manuals are simple to connect. Air On Ryo Zan is only an opener at full Wrath, which means it will also be a counter-hit and a recapture, and similarly large frame advantage will apply. Hisako can also begin a combo after both of her regular throws, no matter the location on the screen. It is not a true opener since you cannot cancel it into auto-doubles or linkers, but there is enough time to link a light or medium manual. The KV starts quite high, so your follow-up combo will be short, but there are also tricky reset possibilities here, especially with full Wrath, that make Hisako's regular throw particularly scary. For example, do a regular throw and then immediately do an Influence command grab to catch people who might try to break. With full Wrath, this starts a new combo with lower KV. Hisako's linker game is quite straightforward. On Ryo Zan as a linker looks very similar in animation and cadence to Jago's Laser Sword and Spinal's Soul Sword linkers, and can be broken with similar visual and audio cues. It can be difficult to tell these linkers apart from her auto-doubles, which also frequently use her naginata, so watch for the giant green swiping special effect her blade emits during the linker. For the Influence linker, Hisako delivers a strike that slices through her opponent but does not switch sides. Both Influence and On Ryo Zan do similar damage and leave the opponent in a similar location; On Ryo Zan is slightly faster to allow more heavy auto-doubles in lockout situations, while Influence adds considerably less to the KV meter. Hisako's auto-doubles and linkers do not cost her any Wrath to perform. Hisako's shadow On Ryo Zan is her only traditional shadow linker, and it has the second longest total duration in the game (behind Tusk's shadow Skull Splitter). You may struggle to break this linker because the timing is very spaced out and the hits have relatively few active frames. My best advice to break this linker is to watch Hisako's hands and break almost entirely visually, using rhythm as your backup. She begins to swing her hands slightly before the break window becomes active, so by the time you see it and you're prepared to break, you'll be right in line with the middle of the window. The fifth hit is particularly curious; it follows a 24 frame gap, the longest gap between hits of any shadow linker, so your timing for breaking the fifth hit needs to follow a pause about 1.5x as long as the pause between any other hits. Again, watch deliberately for Hisako's hands to swing down before you press your break buttons and this extra delay will never trick you again. Shadow Air On Ryo Zan is unlikely to be used in many combos besides as an unbreakable opener, but if someone does find a unique way to use it mid-combo, it can be broken with a standard "rapid fire" pattern. Possession does good damage to end a combo, but the opponent is able to quick rise the knockdown, meaning you will be unable to regenerate any Wrath you may have spent before your combo started, so it is best used to end a round or if you have nearly full Wrath already. Influence is a hard knockdown, which gives Hisako the time she needs to regenerate her Wrath to maximum, and even allows her to perform some interesting setups with jumping crossups. Since Influence still does respectable damage and Wrath is so important to Hisako's game, this is likely to be the ender Hisako players use the most. On Ryo Zan is her Wall Splat ender, and like most characters with command grabs, she gets extra guaranteed damage by landing a grab after the wall splat completes, regardless of the KV. If you spend a stock of shadow meter on shadow Influence after the wall splat, you can add an extra 4% compared to regular Influence and you will be able to take advantage of the Wrath regeneration as well. Hisako doesn't get to perform too many juggles, but she does have the ability to perform recapture and flipout. Using Air On Ryo Zan to recapture is great if your opponent is trying to jump away from Hisako's mixups, but you need full Wrath for the regular version to recapture, or else it will just cause a knockdown. Hisako's primary anti-air move, crouching HP, will launch the opponent, which gives her a few different options. If you had full Wrath, the launch is much higher than normal and you can jump and use shadow Air On Ryo Zan to recapture. If you're looking for a reset instead, you can jump after the launched opponent and use jumping LP to flip them out, then land and do a command grab mixup. If you don't have full Wrath, you will still have enough time to use standing LP to cause flipout. Importantly, because crouching HP is not an opener, in these situations the flipout and recapture will not be breakable! In instinct mode, Hisako's Wrath gauge is permanently full. In addition, both versions of Vengeance work against all strikes, regardless of whether they hit high or low, which strengthens Hisako's wakeup game. Full Wrath makes Hisako incredibly dangerous at several ranges. She can fish for counter-hits at range to her heart's content, since missing with a normal will not prevent her next attempt from counter-hitting. She has permanent access to Vengeance counter cancels, no matter what string of attacks preceded it, which means defenders need to be perpetually nervous about pressing any perceived advantage they may have. But perhaps most importantly, every Hisako Influence grab and air On Ryo Zan will lead to a full combo, and most close-range defensive options will lose to one of these two options (Vengeance will cover invincible reversals). It can be difficult to escape Hisako's close-range pressure game with so many threats available to her. Because every medium and heavy normal is a counter-hit with full Wrath, when Hisako is in instinct, she gets access to certain "freestyle" combos where she can string together numerous counter-hit/stagger normals mixed in with Air On Ryo Zans. Starting on the third hit, these combos are breakable using manual rules, but the damage and ender level add up really fast and mixing in other attack timings can make these combos difficult to break. These combos can easily be started by certain counter-hit setups in the neutral game, a close-range air On Ryo Zan mixup, a Vengeance counter against a long-range or aerial opponent, or her crouching HP anti-air attack. Hisako is equipped with a large set of useful normals. Virtually all of her medium and heavy buttons are useful, whether standing, crouching, or jumping, but there are a few particularly noteworthy ones. Standing MP might be Hisako's best mid-range poke; it's fast at 8 frames, covers half the screen, and is cancelable into On Ryo Zan. If you have full Wrath, you can confirm counter-hit standing MP into shadow On Ryo Zan as a link from any range. Standing HP goes a little farther and has good uses in footsies, but is considerably slower at 16 frames. Both crouching MK and HK are exceptionally long range low attacks, and crouching MK leads to On Ryo Zan. Close standing HP, HK, and far standing HK will stagger on counter-hit, and Hisako can combo after these attacks by dashing in and doing another attack, or by linking air On Ryo Zan. For anti-airs, crouching HP is the best choice if you can handle the slightly slow startup, otherwise choose crouching MP. Jumping HP is fantastic as an air-to-air attack, and jumping HK is her go-to crossup attack. An unfortunate weakness of Hisako's normals is that her light attacks cannot combo into any of her grounded opener special moves except shadow On Ryo Zan, so she struggles to easily punish moves in the -5 and -6 range. It's best to try and use Vengeance to counter these before you block them if possible. As described in the Openers section, Vengeance is perhaps her best special move, and it is the only special move Hisako players can use as a reversal to beat strikes. It is important as a Hisako player to keep this move always in mind and use it to escape situations where other characters are forced to block, such as on reaction to shadow moves and slower special moves like TJ Combo's Tremor or Tusk's sword normals. It's also a pretty decent move to predict mid-range pokes or jump-in attempts, and it protects her from any attempt at ambiguous crossups on her wakeup. Opponents need to approach Hisako differently because she has Vengeance, employing empty jumps, throws, and more liberal use of overhead/low mixups, since Hisako has to choose which version of Vengeance to use. Air On Ryo Zan is best performed using a tiger kneeA tiger knee motion for any air special move involves inputting the command on the ground, then rolling the joystick to up-forward and pressing the punch or kick button. The special move comes out very close to the ground, which is important for moves like air On Ryo Zan that swing downwards at the opponent. It's best to think of tiger knee motions as one smooth movement; in this case, as a quarter circle forward finishing at up-forward. motion, keeping her close to the ground. Air On Ryo Zan is safe on block and the heavy version can cross up, making it a very strong close range pressure tool that beats lows and throws and forces opponents to respect a left-right mixup from the ground, but it only leads to a combo if you have full Wrath, so it becomes less effective if even just one of them is blocked. Hisako has two command grabs. Influence is a very close-range, throw invincible grab that causes a hard knockdown. If you have full Wrath, it acts as an opener and feels very similar in application to SFIV Makoto's Karakusa. Light Influence is the fastest grab in the game at 3 frames, which is faster than any normal attack and ties for the fastest special move in the game, and it's exceptional as a surprise attack after Hisako's incredibly fast forward dash. Unfortunately, its range is so short that it will whiff unless you are as close as possible, which limits its uses in tick throw scenarios. Medium or heavy Influence are best used if you are trying to tick off light attacks or if you can't get close enough, but these grabs are slower at 7 and 10 frames respectively. Shadow Influence is 6 frames of startup and 0 frames (and therefore inescapable) after the freeze, and Hisako crawls towards her opponent to extend her range substantially, so it can be used in situations similar to Thunder's shadow Call of the Earth grab. Opponents need to be very wary of this move from around two Hisako dash lengths away; doing one dash and shadow Influence is virtually unreactable, so you will need to take pre-emptive measures to avoid it. Her other command grab is Possession, a move that vacuums the opponent towards Hisako, where she enters the opponent's body and breaks their bones before causing a soft knockdown. This move is interruptible with attacks and is heavily punished by neutral jumping on reaction to Hisako's vacuum effect, but can be used as a much longer range tick grab, as a trip guard punish, and is effective against characters who need to use floaty jumps to escape. Note that Possession is Vengeance cancelable if you have 50% wrath, even extremely late in the animation, so not every jumping attack is a guaranteed punish. Hisako demands a more patient, deliberate playstyle out of both players in the match. Vengenace can and should be used to punish linear offense on prediction or reaction, and because it is not tied to her Wrath meter, this technique must always be respected. However, despite this, Hisako can still strongly feel the heat on her wakeup, as she struggles to defend against empty jumps, high/lows, and throw mixups, and Vengeance has a long whiff animation after the counter window has passed, so it is fully open to punishment if used poorly. Because Hisako's walk speed is so poor, the only real method for moving around the screen is by jumping or dashing, and you cannot block during any of these options, which means Hisako players need to know where they want to be on screen and have a plan to keep that space. This is perhaps the greatest difficulty in playing Hisako effectively, especially for players who do not have experience with slow walk speed characters. It's possible to play Hisako disregarding her Wrath meter, but it's definitely ill-advised, as you will lose access to meaningful damage from her best mixups (Influence and air On Ryo Zan), and you will not be able to cancel moves into Vengeance counters at opportune times. Even the threat of sitting on full Wrath will make your opponent nervous to punish certain things, and you may escape some situations for free without having to take the risk. If you are struggling to keep your Wrath high, you will need to pick and choose more carefully when to use Hisako's beastly normals, or try to land an Influence command grab (as a combo ender or in neutral) to earn a hard knockdown and regenerate your Wrath by sitting still. Otherwise, Hisako is best played as a patient character that threatens in surprising bursts of activity; dashing in with Influence, shadow Influence, or air On Ryo Zan, and pestering with long-range normals into grounded On Ryo Zan mixups will force opponents to pick and choose when to try and stop Hisako's approaches without running into Vengeance. 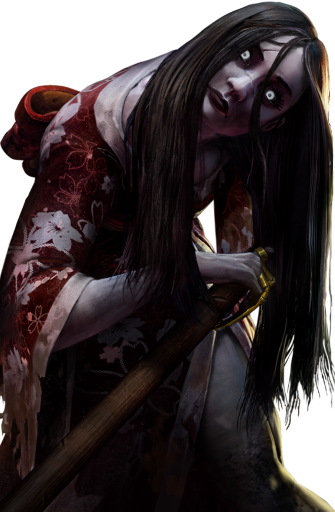 Hisako, like her character suggests, is all about making your opponent scared to press buttons, and she has more than ample tools to keep people spooked, both inside and outside the game. Show me a fugitive on fire.